During the presidential election campaign, the major-party candidates ran on a platform of change and reform in Washington. Domestic policy and the economy eventually emerged as the main themes in the last few months of the election campaign after the onset of an economic crisis. Nine states voted for a different party than they did in the 2004 election. Each had voted for the Republican nominee in 2004 and contributed to Obama's sizable Electoral College victory. The selected electors from each of the 50 states and the District of Columbia voted for President and Vice President of the United States on December 15, 2008. Those votes were tallied before a joint session of Congress on January 8, 2009. This was the first U.S. presidential election in which a person of color was elected President, as well as the first in which a person of color received the nomination of one of the two major parties. An issue that was brought up was possible, and then actual, nomination by the Democratic Party. On August 28, 2008, when Obama formally accepted the Democratic nomination for President, he became the first African American to be nominated for President by a major political party. The television audiences for both McCain's and Obama's acceptance speeches broke records, according to Nielsen ratings. Obama’s promised “universal health care, full employment, a green America, and an America respected instead of feared by its enemies”. He used new media to “form a bond with his supporters” which helped him “appeal to the youth audience’s need to feel special, in-the-know, empowered and special”. This was best displayed in his text message announcement of Joe Biden as the vice-presidential candidate. He has also declared, in his book The Audacity of Hope, that he did not experience a religious upbringing. Rather he developed his faith due to the church’s ability to motivate social change. Bowdern wrote, "This is best exemplified in his “50 state strategy”, where he campaigned in states that historically would never vote for a Democrat. The 2008 presidential election saw a large youth turn out, up to 51%." In an October 17–20, 2008, NBC News/Wall Street Journal poll of registered voters, 2% said race made them more likely to vote for Barack Obama, 4% said it made them less likely to do so, and 2% were not sure. Race was not a major factor for the other 92% (margin of error was ±2.9%). Hillary Clinton "openly solicited the votes of 'hard working white Americans'". For Obama, race was the word to be avoided. He would often place white people behind him when in a hall speaking to a large black group in order to avoid racial imagery. Obama had to deal with media related jibes, including Fox News labeling his wife as "Obama's baby-mama" and attempting to interpret a fist tap as either a racial move, or a "terrorist fist jab". Election Day was on November 4, 2008. The majority of states allowed early voting, with all states allowing some form of absentee voting. Voters cast votes for listed presidential candidates but were actually selecting representatives for their state's slate of Electoral College. This table records the official final state election-board tallies for those presidential candidates who were listed on ballots in enough states to have a theoretical chance for a majority in the Electoral College. The first two columns contain the state name and its number of electors. Bold indicates statewide vote count winner in each state and winners in each electoral district of Maine and Nebraska, the only two states that apportion electoral votes by district. State popular vote results are from the official Federal Election Commission report. 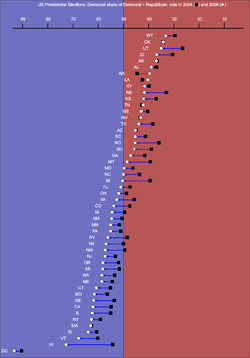 Four states, Georgia, Illinois, New York, and Ohio, have since amended the popular vote results. The updated Georgia results, Illinois results, New York results, and Ohio results are included here. The two rightmost columns show 1)Obama's percentage margin over McCain and 2)the percentage cast for the two major candidates combined. Obama, having a Caucasian mother and Kenyan father of the Luo ethnic group, became the first African American and the first bi-racial president. The Obama-Biden ticket was also the first winning ticket in American history on which neither candidate was a WASP; Biden is Roman Catholic and is the first Roman Catholic to be elected Vice President. 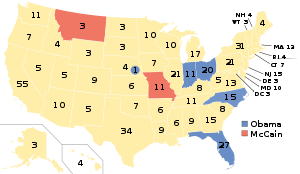 Obama and Biden were the first President and Vice President elected from the Senate since 1960 (Kennedy/Johnson), Obama was the first Democratic president since JFK who was not from the South, and the Obama-Biden ticket was the first winning Democratic ticket to not feature a Southerner since 1940 (Roosevelt-Wallace). This election exhibited the continuation of some of the polarization trends evident in the 2000 and 2004 elections. McCain won whites 55-43 percent, while Obama won blacks 95-4 percent, Hispanics 67-31 percent, and Asians 62-35 percent. Voters aged 18–29 voted for Obama by 66–32 percent while elderly voters backed McCain 53–45 percent. ^ "Katrina Response Hurts Bush Most". Political Wire. February 17, 2006. http://politicalwire.com/archives/2006/02/17/katrina_response_hurts_bush_most.html. ^ Kuhnhenn, Jim (November 9, 2006). "Democrats win control of Congress". The Boston Globe. http://www.boston.com/news/nation/articles/2006/11/09/democrats_win_control_of_congress/. Retrieved June 7, 2009. ^ "LA rally—Full Video". YouTube. http://www.youtube.com/watch?v=JZiNtTq10i0. ^ Oinounou, Mosheh; Bruns, Aaron (April 12, 2008). "Obama on Guns and Religion: 'I Didn't Say It as Well as I Should Have'". Fox News. http://www.foxnews.com/politics/elections/2008/04/12/obama-on-guns-and-religion-i-didnt-say-it-as-well-as-i-should-have/. Retrieved June 8, 2009. ^ "NC—Election Results". North Carolina State Board of Elections. May 7, 2008. http://results.enr.clarityelections.com/NC/1875/4822/en/summary.html. Retrieved June 8, 2009. ^ "Obama claims Democratic nomination—Decision '08- msnbc.com". Msnbc.msn.com. June 4, 2008. http://www.msnbc.msn.com/id/24944453/. Retrieved January 24, 2009. ^ "Historic night: Obama clinches nomination—Bill Nichols and Ben Smith". Politico.com. http://www.politico.com/news/stories/0608/10797.html. Retrieved January 24, 2009. ^ Harnden, Toby (November 13, 2007). "The top US conservatives and liberals". London: Telegraph.co.uk. http://www.telegraph.co.uk/news/uknews/1435447/The-top-US-conservatives-and-liberals.html. Retrieved September 7, 2008. ^ Charles G. Dawes, 30th Vice President (1925-1929), U.S. Senate. ^ "Obama Wins Democratic Presidential Nomination". Fox News. August 27, 2008. http://www.foxnews.com/politics/elections/2008/08/27/obama-wins-democratic-presidential-nomination/. Retrieved June 17, 2009. ^ Hendrik Hertzberg (January 4, 2008). "A Hundred Years' War?". The New Yorker. http://www.newyorker.com/online/blogs/hendrikhertzberg/2008/01/a-hundred-years.html. ; video at "McCain's Hundred Years War". Dallas Morning News Opinion Blog. January 3, 2008. http://dallasmorningviews.beloblog.com/archives/2008/01/mccains_hundred.html. ^ "Obama officially announces run for the White House". Chicago Business News. http://www.chicagobusiness.com/cgi-bin/news.pl?id=23835. Retrieved January 29, 2009. . Video on YouTube. ^ Simba, M. (2009). "The Obama Campaign 2008: A Historical Overview". Western Journal of Black Studies, 33(3), 186-191. Retrieved from EBSCOhost. ^ Jackson, K. M., Dorton, H., & Heindl, B. (2010). A celebration that defined a generation: Grant park, new media, and Barack Obama's historic victory of the US presidency. The Journal of American Culture, 33(1), 40-51. ^ Obama, B. (2006). The Audacity of Hope. New York: Crown Publishers. ^ Friday, August 29, 2008 (August 29, 2008). "Sarah Palin—John McCain’s VP Choice". Outsidethebeltway.com. http://www.outsidethebeltway.com/archives/sarah_palin_-_john_mccains_vp_choice/. Retrieved January 30, 2009. ^ "Sarah Palin seen as beacon of hope as defeat at poll looms". The Daily Telegraph (London). http://www.telegraph.co.uk/news/newstopics/uselection2008/3205619/Sarah-Palin-seen-as-beacon-of-hope-as-defeat-at-poll-looms.html. ^ Schnur, Dan (November 3, 2008). "What caused McCain's poll numbers to fall?". Los Angeles Times. http://www.latimes.com/news/opinion/web/la-oew-schnur-cain3-2008nov03,0,2312294.story. Retrieved January 29, 2009. ^ "Free and Equal". Freeandequal.org. http://www.freeandequal.org/events.php?id=7. Retrieved November 3, 2008. ^ "Top Presidential Candidate 2008 Websites". Hitwise. http://www.hitwise.com/political-data-center/key-candidates.php. ^ Staples, Robert (2010). "The Post Racial Presidency: The Myths of a Nation and its People". Journal Of African American Studies 14 (1). DOI:10.1007/s12111-009-9102-9. ^ Walsh, Eileen T. (2009). "Representations of Race and Gender in Mainstream Media Coverage of the 2008 Democratic Primary" 13 (2). DOI:10.1007/s12111-008-9081-2. ^ FOXNews.com (November 4, 2008). "Judge Orders Virginia Officials to Keep Late Ballots—FOXNews.com Elections". Elections.foxnews.com. http://elections.foxnews.com/2008/11/04/judge-orders-virginia-officials-late-ballots/. Retrieved November 7, 2008. ^ Lewis, Bob (November 3, 2008). "McCain sues to force Va. to count military ballots". USA Today. Associated Press. http://www.usatoday.com/news/politics/2008-11-03-3570916134_x.htm. Retrieved November 7, 2008. ^ Hoppe, Christy (September 19, 2008). "Libertarian Bob Barr sues to have McCain, Obama cast off Texas' ballot". Dallas Morning News. http://www.dallasnews.com/sharedcontent/dws/news/politics/state/stories/DN-barr_19pol.ART.State.Edition1.268aa61.html. Retrieved October 8, 2008. ^ "Palin hits Obama for 'terrorist' connection". CNN. 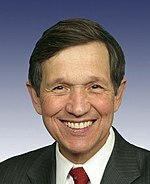 2008-10-05. http://m.cnn.com/cnn/lt_ne/lt_ne/detail/178228. ^ Jong, Erica (May 5, 2008). "Inspiration Versus Degradation". The Huffington Post. http://www.huffingtonpost.com/erica-jong/inspiration-versus-degrad_b_98844.html. ^ High Marks for the Campaign, a High Bar for Obama. Retrieved November 15, 2008. ^ "NBC calls Ohio for Obama—First Read—msnbc.com". Firstread.msnbc.msn.com. November 4, 2008. http://firstread.msnbc.msn.com/archive/2008/11/04/1639565.aspx. Retrieved January 24, 2009. ^ "Scenes of joy across the US—Local News—News—General". The Canberra Times. November 5, 2008. http://www.canberratimes.com.au/news/local/news/general/scenes-of-joy-across-the-us/1352918.aspx. Retrieved January 24, 2009. ^ "Huge turnout as America votes". The Australian. November 5, 2008. http://www.theaustralian.news.com.au/story/0,25197,24605006-2703,00.html. Retrieved July 16, 2009. ^ "Black and Latino Turnout". http://www.nonprofitvote.org/voterturnout2008#minorities. ^ The New York Times (November 4, 2008). "2008 Presidential Race: Virginia—Election Guide—The New York Times". Election Guide 2008 - The New York Times (The New York Times Company). http://elections.nytimes.com/2008/president/states/virginia. Retrieved June 2, 2009. ^ The New York Times (November 4, 2008). "2008 Presidential Race: Georgia—Election Guide—The New York Times". Election Guide 2008 - The New York Times (The New York Times Company). http://elections.nytimes.com/2008/president/states/georgia. Retrieved June 2, 2009. ^ The New York Times (November 4, 2008). "2008 Presidential Race: Mississippi—Election Guide—The New York Times". Election Guide 2008 - The New York Times (The New York Times Company). http://elections.nytimes.com/2008/president/states/mississippi. Retrieved June 2, 2009. ^ "Ballot Access News—November 1, 2008". Ballot-access.org. March 18, 2008. http://www.ballot-access.org/2008/110108.html#6. Retrieved January 24, 2009. ^ Cost, Jay (November 20, 2008). "HorseRaceBlog—Electoral Polarization Continues Under Obama". RealClearPolitics. http://www.realclearpolitics.com/horseraceblog/2008/11/polarization_continues_under_o.html. Retrieved January 24, 2009. This page uses content from the English language Wikipedia. The original content was at United States presidential election, 2008. The list of authors can be seen in the page history. As with this Familypedia wiki, the content of Wikipedia is available under the Creative Commons License.